Some people are victims…some people are playing victim. 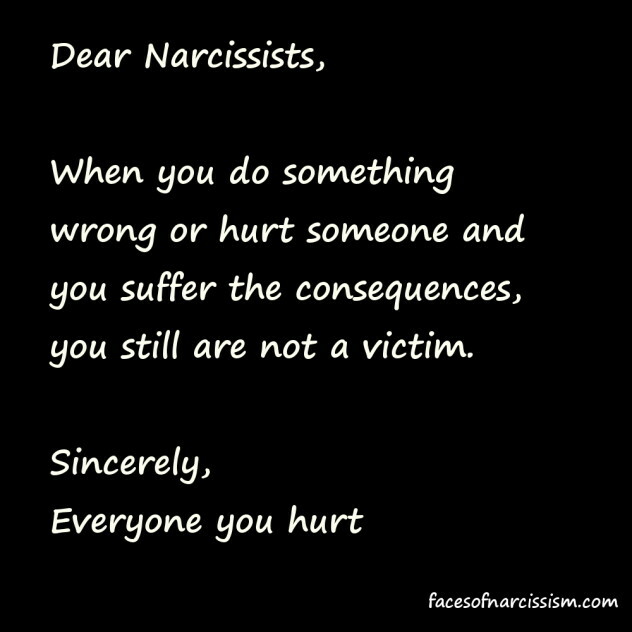 And no one is better at playing up victim status than the narcissist who hurts others. Somehow, they will make their victims the bad guy simply because their victims refuse to accept their behavior anymore! As adults, we are free to have our own boundaries. We are free to make our own decisions. We are free to stand up for ourselves…and in fact we should! But narcissists do not like that idea. 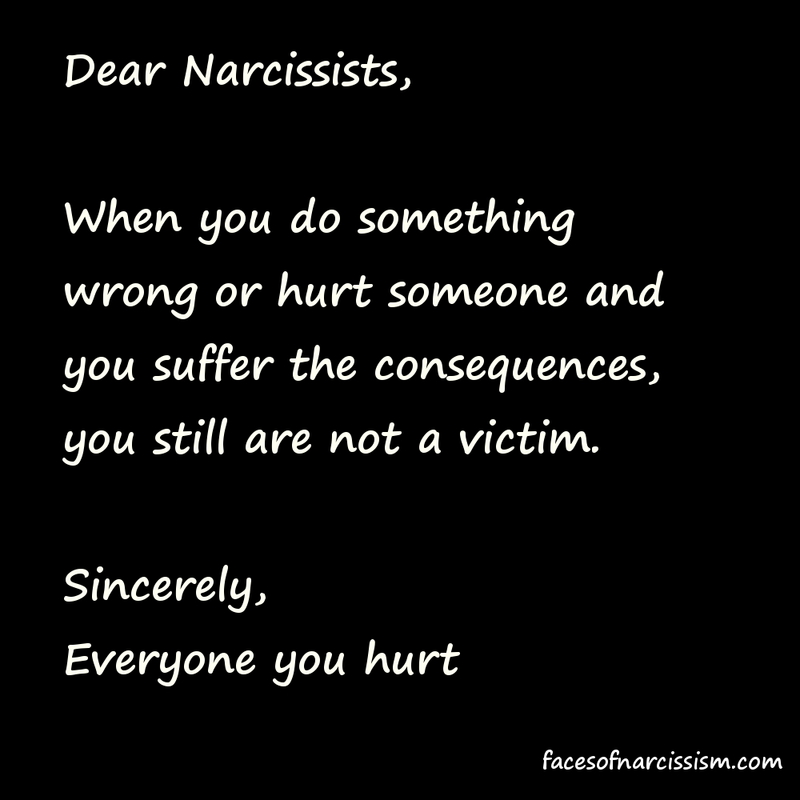 If a narcissist does something inappropriate and you put up the emotional stop sign or hold them accountable legally, they will get mad at YOU and claim that they are being “attacked.” They want to manipulate us and push and bully us into believing we do not have the right to stand up for ourselves, but don’t let them fool you! They want you to waver and let down your guard. They want you to feel guilty for protecting yourself. These people do not respect boundaries–they will just keep pushing you. They don’t like to accept “no” as an answer. I’ve said it before and I’ll say it again because it is always true! The first clue I had that my ex was a narcopath was that, when he hurt people and was held accountable, he blamed the people he hurt. When he bullied a co-worker and got written up, it was the co-worker’s fault for talking to a manager. When he drove too fast and got a ticket, it was the police officer’s fault for giving him the ticket. When he assaulted me and got arrested, it was my fault for calling the police. This is a clear sign that you are dealing with a disordered person. When THEY do something wrong and you hold your boundaries and hold them accountable, they play victim and act like you are hurting them. In reality, you are not wrong to stand up for yourself, your rights and your boundaries. Don’t let them bully you into thinking you are! The narcissist is counting on us having weak boundaries and caving to their persistence and demands. Sometimes it’s hard for many of us to allow ourselves to protect ourselves. We have to fight the guilt and the peer pressure from flying monkeys who have a warped story from the narcissist. We begin to doubt or we start to give in…and the narcissist wins. Don’t let them do this to you! We have a right to take care of ourselves and make decisions in our best interests. We have the right to look out for our legal rights. We have the right to be with those who improve our lives while avoiding those who make us miserable. The narcissist doesn’t like it, but it’s not their choice, is it? Brace yourselves! Mother’s Day is coming! You got that right!! It is not their choice. We need to wake up each day and be prepared to tell ourselves we are not going to accept them doing what they do and doing what they say to us. Whenever my husband degrades me or sends me a nasty text message (because I refuse to listen to him when he talks to me in front of the kids) I simply say “you are not going to ever hurt me again. You will not abuse me”. For some reason it shuts him up. I try to never engage in any kind of confrontation. It only gets me upset and he loves to see that. I’m getting better at not letting him know and he hates that I don’t get bad and that I’m calling the shots. I hired a cleaning lady because I get no help from him. For months I have been asking for the family to help. He sends me a text saying it is such a waste of money to pay someone. The house could be a little messy. I wrote back: it’s my health we are talking about and she will be back next week. I know that killed him but I’m not going to argue the situation with him ever again. He won’t change. So it’s like you are fighting a losing battle all the time. Why put yourself in that battle. Thanks for keeping us in track!!! I so need to read your posts!!!!! Thank you for this validation. It really helps! I went NO CONTACT about ten years ago and went from therapist to therapist for support. I didn’t feel that they understood for real, or got it. I always felt more lonely, isolated and more anxious. It wasn’t until very recently that I discovered Facebook. I know, it seems weird, but I always thought that Facebook was just for individuals/families. I realized that there were support group pages for people like me. I have gotten more validation and understanding in the last few weeks from people like you that write incredibly helpful articles like these than decades of costly therapy from highly educated individuals. Experience knows from the heart. One cannot heal without truly being heard or understood. It breaks the isolation and clears the mind of the old, self-doubting chatter. Thank you Joanna, from the very core of me. Josie. OMG. How true. Too bad that doesn’t happened a lot but they definitely should be held accountable for there actions. i have veen involved with (i have just been enlightened) a Narcissist on and off for the past 3 years. i have just broken off with him and was having coffee with a friend (an Advocate) whilst i was telling her about it and how i felt, she suddenly said ‘he is a Narcissist’. i did not know what that was but on her advice i looked it up and OMW it was 100% him. i am now no longer going to contact him but i will be sueing him for the money which i kent him and which he has no intention of paying back as when i bring the subject up he replies with no reference to the money just how much he is misunderstood but nothing relative to the subject of the money owing. i now know for 100 reasons after reading the articles that i know what and who is a Narcissist, my ex down to every detail.